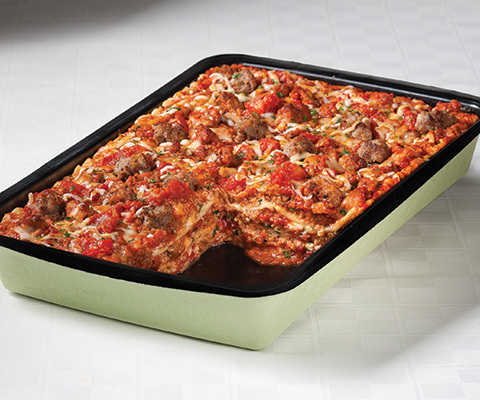 Simplify the preparation and shorten the bake time by using no-boil lasagna noodles. In a medium bowl, mix together ricotta cheese and egg. Season with salt and pepper if desired. Cover and set aside. In a large skillet over medium high heat, cook pepper, onion and garlic for 2 to 3 minutes, stirring occasionally. Add sausage and cook for 4 to 6 minutes, or until cooked through, stirring until small sausage crumbles form. Stir in Pasta Sauce and wine. Reduce heat to medium and simmer for 10 minutes, or until heated through, stirring occasionally. Remove from heat. Preheat oven 375°F. Spread 1 cup of Pasta Sauce evenly over the bottom of 13x9 baking dish. Arrange 3 lasagna noodles and spoon about 2 cups of sauce mixture over top. Layer with 1/3 of ricotta cheese mixture, 1 cup of mozzarella cheese, 3 lasagna noodles and 1/3 of remaining sauce mixture. Repeat layers twice, making sure pasta is completely coated with sauce on top. Sprinkle with Parmesan cheese and remaining 1 cup of mozzarella cheese. Cover tightly with aluminum foil and bake for 20 minutes. Remove foil and bake for additional 15 minutes, or until hot and bubbly. Allow to rest for 5 to 10 minutes before serving. If preferred, substitute red wine with water or beef broth.